Now that the city prepares to close streets within the Atlantic Yards footprint, what about access for people still living there? Who's in charge of the traffic mitigation plan? What happens to NYPD parking? There are still a few people living on Pacific Street (slated to close) and others on Dean Street (not closing). Can they get a ride home in the rain? 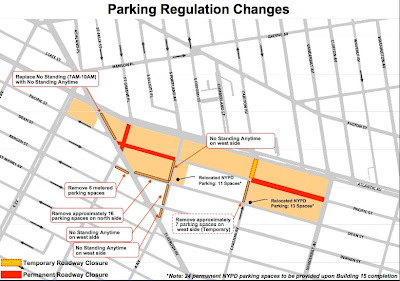 "Local traffic, including residents, friends, family, and deliveries will be able to park on the closed street, as well as City services such as FDNY, NYPD, and Sanitation," Empire State Development Corporation spokeswoman Elizabeth Mitchell responded. "There will also be vehicles traveling to and from the construction site. The streets will operate as a cul de sac with vehicle turn around on the vacant lot between 624 and 636 Pacific Street. Signs will be posted at the intersection of Pacific and Sixth Avenue stating that it is a private street with no outlet. The closings are scheduled on or about February 1, which is after the scheduled January 29 hearing on the condemnation petition, after which, if all goes smoothly--and there are always twists in the AY story--title of property in the AY footprint would be transferred to the state. Would the streets close even if title is not transferred? Stay tuned. Northbound traffic on Fifth Avenue would be directed to use Flatbush Avenue or Sixth Avenue to continue north; southbound traffic can use Sixth Avenue. That would make for an additional burden on Sixth, where traffic would become two-way between Flatbush Avenue and Pacific Street. Also, a block of Carlton Avenue (between Dean and Pacific Streets) would become two-way. As a replacement for eastbound traffic on Pacific Street, drivers could use Dean Street, while those going west could use Bergen Street. What's the mitigation? The use of what are marked on the map as TEA (Traffic Enforcement Agents) and VMS (Variable Message Signs). 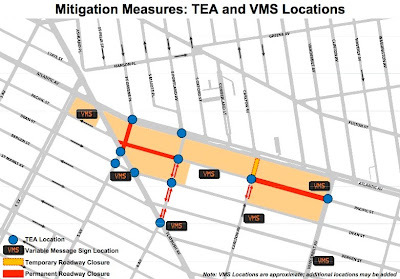 The traffic plan, as shown on the web site of the Prospect Heights Neighborhood Development Council (PHNDC) and linked below, comes from Forest City Ratner's traffic consultant, Sam Schwartz Engineering. Most of the presentation below involves lane reconfiguration. As the graphic shows, not only would parkings spaces be removed on Dean Street and Sixth Avenue, parking for the New York Police Department's 78th Precinct--currently located along Sixth Avenue, for the most part--would be moved to two lots within the project footprint. Given the demolition of two buildings at the northeast corner of Sixth Avenue and Dean Street, there'd be 11 parking spaces for the NYPD, presumably next to a staging area for construction. Also, there would be 13 spaces on the block designated for indefinite interim surface parking. And when would the NYPD get 24 permanent parking spaces? Not until the arrival of Building 15, which, according to the approved Construction Schedule, was not supposed to be built until six years after arena construction began. As of now, however, the timing of Phase 2 of the project is a mystery, though the Empire State Development Corporation projected in a June 2009 Technical Memorandum that the building would open in 2015.